Several studies have been done on Lupus Nephritis (LN) and the related outcomes, but there are limited data about the outcome of the disease in Iranian patients. Our aim of this study was to determine predictive factors of poor prognosis of LN amongst an Iranian population. This retrospective study included 111 LN patients, which were followed at least for one complete year according to their medical records. Data such as age, gender, geographical region, classification of renal biopsy, serum creatinine, blood pressure, complement levels, proteinuria, anti-dsDNA level, hemoglobin, Glomerular Filtration Rate (GFR) and serum albumin were collected. The short-term outcome was considered as complete remission, partial remission or non-remission; possible factors affecting the occurrence of these outcomes were evaluated. Pearson Chi-Square test and logistic regression were used for data analysis. A P value of less than 0.05 was considered statistically significant. Female: male ratio was 9.1:1 and the mean age of patients was 26.86±7 years. Low albumin, low GFR, low hemoglobin, high systolic and diastolic blood pressure, high serum creatinine, proteinuria and biopsy class IV at baseline were significantly associated with no remission or partial remission. There was no relationship between the mentioned outcomes and age, gender and geographic region of the subjects. All variables associated with the risk of non-remission should be considered in determining the prognosis and treatment plan. Of all the factors mentioned above, systolic blood pressure and low C3 levels had the highest correlation with the failure of remission. Vozmediano C, Rivera F, Lopez-Gomez JM, Hernandez D. Risk factors for renal failure in patients with lupus nephritis: data from the Spanish registry of glomerulonephritis. Nephron Extra 2012; 2(1): 269-77. doi: 10.1159/000342719. Ebadi A, Zamani B, Soleimani AR, Tamadon MR, Arbabi M. Epidemiologic study of 40 patientswith lupus nephritis in Imam Khomeini. Bimonthly J Hormozgan Univ Med Sci 2006; 10(3): 231–6. Saadati N, Haami M, BehroozAghdam A, Naghibzadeh B. Corrolation between clinical symptoms and renal pathology in patients with systemic lupus erythematosus (Persian). Med J Mashhad Univ Med Sci 55(2): 218-4. Rajaee A, Behzadi S, Bazmi S, Moayeri M. The clinical and pathological findings among patients with lupus nephritis in Shiraz, Southern Iran. Shiraz E-Med J 2005; 6(1, 2): 2-7. Barr RG, Seliger S, Appel GB, Zuniga R, D’Agati V,SalmonJ, et al. Prognosis in proliferative lupus nephritis: the role of socio-economic status and race/ethnicity. Nephrol Prognostic factors of lupus nephritis. Dial Transplant 2003; 18(10): 2039-46. doi: 10.1093/ndt/gfg345. Hahn BH. Systemic Lupus Erythematosus. In: Longo DL, Fauci AS, Kasper DL, Hauser SL, editors. Harrison’s principles of internal medicine. 18 ed. USA: Mc Graw Hill companies; 2012. p. 2732. Dhir V, Aggarwal A, Lawrence A, Agarwal V, Misra R. Long-term outcome of lupus nephritis in Asian Indians. Arthritis Care Res (Hoboken) 2012; 64(5): 713-20. doi: 10.1002/acr.21597. Yokoyama H, Wada T, Hara A, Yamahana J, Nakaya I, Kobayashi M, et al. The outcome and a new ISN/RPS 2003 classification of lupus nephritis in Japanese. Kidney Int 2004; 66(6): 2382–8. doi: 10.1111/j.1523-1755.2004.66027.x. Kotchen TA. Hypertensive vascular disease. In: Longo DL, Fauci AS, Kasper DL, Hauser S. L. editors. Harrison’s principles of internal medicine. 18 ed. USA: Mc Graw Hill companies; 2012. p. 2047. Adamson JW, Longo DL. Anemia and Polycythemia. In: Longo DL, Fauci AS, Kasper DL, Hauser SL, editors. Harrison’s principles of internal medicine. 18 ed. USA: Mc Graw Hill companies; 2012. p. 450. Korbet SM, Lewis EJ, Schwartz MM, Reichlin M, Evans J, Rohde RD. Factors predictive of outcome in severe lupus nephritis. Lupus Nephritis Collaborative Study Group. Am J Kidney Dis 2000; 35(5): 904-14. Bargman JM, Skorecki K. Chronic kidney disease. In: Longo DL, Fauci AS, Kasper DL, Hauser SL, editors. Harrison’s principles of internal medicine. 18 ed. USA: Mc Graw Hill companies; 2012. p. 2308. Lewis JB, Neilson EG. Glomerulardisease. In: Longo DL, Fauci AS, Kasper DL, Hauser SL, editors. Harrison’s principles of internal medicine. 18 ed. USA: Mc Graw Hill companies; 2012. p. 2337. Lin J, Denker BM. Azotemia and urinary abnormalities. In: Longo DL, Fauci AS, Kasper DL, Hauser SL, editors. Harrison’s principles of internal medicine. USA: Mc Graw Hill companies; 2012. p. 339. Tesar V, Hruskova Z. Treatment of proliferative lupus nephritis: a slowly changing landscape. Nat Rev Nephrol 2011; 7(2): 96-109. doi: 10.1038/nrneph.2010.170. Nezhad ST, Sepaskhah R. Correlation of clinical and pathological findings in patients with lupus nephritis: a five-year experience in Iran. Saudi J Kidney Dis Transpl 2008; 19(1): 32-40. Chen YE, Korbet SM, Katz RS, Schwartz MM, Lewis EJ, Collaborative Study G. Value of a complete or partial remission in severe lupus nephritis. Clin J Am Soc Nephrol 2008; 3(1): 46-53. doi: 10.2215/CJN.03280807. Sircar D, Sircar G, Waikhom R, Raychowdhury A, Pandey R. Clinical features, epidemiology, and short-term outcomes of proliferative lupus nephritis in Eastern India. Indian J Nephrol 2013; 23(1): 5–11. doi: 10.4103/0971-4065.107187. Ginzler EM, Dooley MA, Aranow C, Kim MY, Buyon J, Merrill JT, et al. Mycophenolate mofetil or intravenous cyclophosphamide for lupus nephritis. N Engl J Med 2005; 353(21): 2219-28. doi: 10.1056/NEJMoa043731. Moroni G, Quaglini S, Gallelli B, Banfi G, Messa P, Ponticelli C. The long-term outcome of 93 patients with proliferative lupus nephritis.Nephrol Dial Transplant 2007; 22(9): 2531-9. doi: 10.1093/ndt/ gfm245. Miranda-Hernandez D, Cruz-Reyes C, Angeles U, Jara LJ, Saavedra MA. Prognostic factors for treatment response in patients with lupus nephritis. Reumatol Clin 2014; 10(3):164-9. doi: 10.1016/ j. reuma.2013.08.001. Korbet SM, Schwartz MM, Evans J, Lewis EJ, Collaborative Study G. Severe lupus nephritis: racial differences in presentation and outcome. J Am Soc Nephrol 2007; 18(1): 244-54. doi: 10.1681/ASN. 2006090992. Ghoreyshi FI. Prognosis in children with lupus nephritis. Med J Hormozgan Univ Med Sci 2005; 8(4): 193-7. Croca SC, Rodrigues T, Isenberg DA. Assessment of a lupus nephritis cohort over a 30-year period. 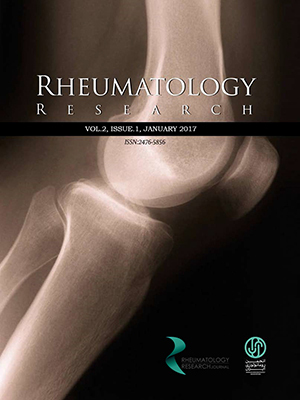 Rheumatology (Oxford) 2011; 50(8): 1424-30. doi: 10.1093/ rheumatology/ker101. Kammoun K, Jarraya F, Bouhamed L, Kharrat M, Makni S, Hmida MB, et al. Poor prognostic factors of lupus nephritis. Saudi J Kidney Dis Transpl 2011; 22(4): 727-32. Austin HA, Muenz LR, Joyce KM, Antonovych TT, Balow JE. Diffuse proliferative lupus nephritis: Identification of specific pathologic features affecting renal outcome. Kidney International 1984; 25(4): 689-95. doi: 10.1038/ki.1984.75. Birmingham DJ, Irshaid F, Nagaraja HN, Zou X, Tsao BP, Wu H, et al. The complex nature of serum C3 and C4 as biomarkers of lupus renal flare. Lupus 2010; 19(11): 1272–80. doi: 10.1177/0961203310371154.